George Greenough : The Innermost Limits of Pure Fun, 1970. 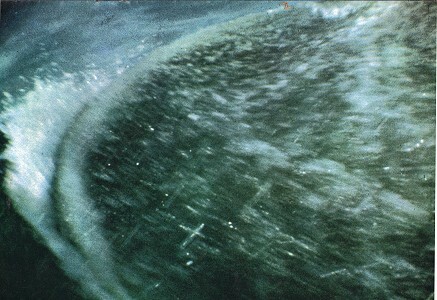 A sequence of six stills taken from movie film shot by George Greenough and published under the title The Innermost Limits of Pure Fun in Surf International, Volume 2 Number 6 in 1970, with the film later released under the same title. 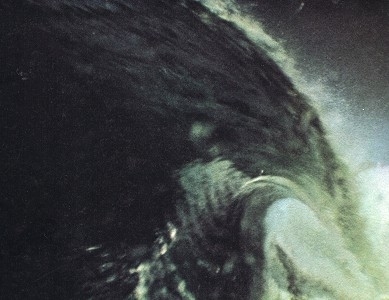 The most remarkable image, #6, was printed double over pages 26 and 27 and in a small format on the front cover, with a caption by the editor, John Witzig: "We think this is probably the most outstanding surfing photograph ever shot." Witzig's use of the conditional has proved to be unnecessary. Some of the text has been slightly reformatted to avoid breaks in the sentences over two pages. 1972 George Greenough : Full Bore Thru the Back Door. 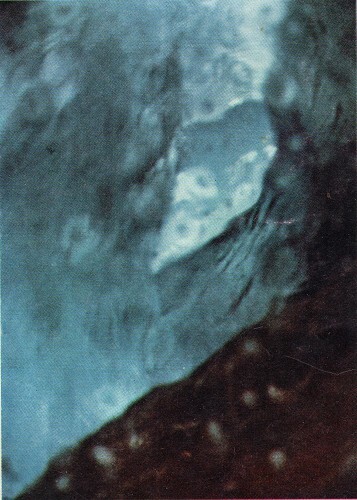 Tracks Magazine October 1972, reprinted in The Best of Tracks (1973) page 191. 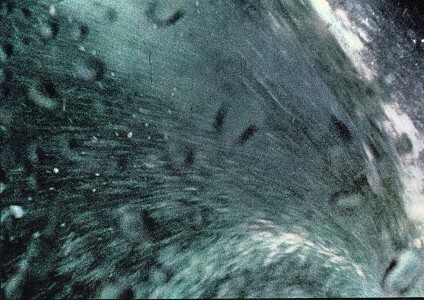 The following series of photographs are taken off frames of a 16mm movie shot by George Greenough. The camera was strapped to his back as he rode his belly board - banking savage turns — hauling cutbacks — running back into curls and finally getting a perfect tube — with the camera grinding from a position six feet in­side a wave. trans­parencies - but they come closest to capturing the real spirit and soul of surfing. 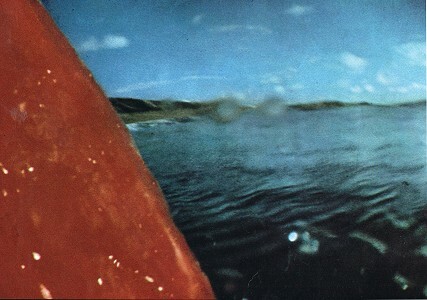 The wave came along and I slid onto it driving straight down holding this track until the board start ed to level out. The turn came hard and quick, Velo laying over almost 90 degrees to the face of the wave as I hit full pow­er, drawing out the arc towards the bowl. Coming in through the back door, climbing with the power off, gliding in a parabolic arc into the pocket at the top. Your head brushes the roof leaving a crazy pattern along the top. The track's a black line sweeping through a sunlit tube. The arc tightens as you start to drive, overtaking the lip on the way down. Blasting out into the sun­light, coming around the bottom of the last section into the clear. Velo's real ly hissing ove"r the water sitting on maximum trim. A little pressure on the inside towards the back draws the board into a long driving turn. Climb­ing to the top 15 feet from the pocket now a boiling rotating mass of white water. The cutback very quick and tight at the same speed as the wave. Driving left towards the pocket you climb until you are almost diving over the back of the wave, turning back now onto that boiling spinning mass. The inside part, rushing up the face, is like an updraft to a gull. You are floating on the upper part of this. The power is off as the board needs only very light adjust­ments to keep it hovering on the upward flowing part next to the face of the wave. Farther ahead a square spot starts to form as you slip back on the solid water driving along the top. Then diving for the bottom; diving for the power rushing over the ledge, turning the base of the wave square with its onrushing speed. Velo's driving slightly left now. Set up on the track for maximum power. The bottom turn comes hard. 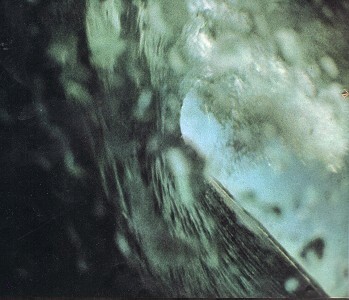 Centrifugal force driving you out against the curr­ent rushing over the ledge into the wave. The 'G' force is really there, jamming you into the board. The acceleration's brutal coming out of the turn, drifting a bit, coming on target now, rolling out up into a long top turn ripp­ing the curl back. The turn becomes very tight as you heel over until your side starts to drag a little. Be­hind, the track becomes a thin white line twisted like a french curve as the board comes around left so fast you're driving back under the track you cut on the way out. Turning down against the white water, then a slight hook back left under it. Trimmed back over the fin bent like a prop driving Velo back around right and onto the inside rail into the arc curving towards the last section sucking out over an inside bank set up for a good tube. The arc flatt­ens out the curl coming by fast ahead of you. Dropping for a little more speed to the bottom of the tube. The whole inside visible now. The curl hitting the base two feet ahead of the nose. Climbing now, the end is near. The tube growing smaller as the wave backs off. Out into a long easy laid back top turn back down then over the top. 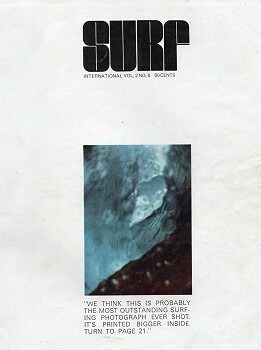 Volume 2 Number 6, 1970. Geoff Cater (2014) : George Greenough : Innermost Limits of Pure Fun, 1970.